Silver-Russell syndrome (SRS) is a rare disorder characterized by intrauterine growth retardation and postnatal growth deficiency along with a handful of common physical characteristics and a range of other symptoms. The incidence is unknown but is estimated at 1 per every 30,000 to 100,000 live births. Due to its clinical heterogeneity, SRS is assumed that it is under- or misdiagnosed in many cases. The wide spectrum of phenotype findings vary both in incidence rate and severity from one individual to another. Besides prenatal and postnatal growth restriction, the most common characteristics are normal head circumference at birth and postnatally (appearing large for the body), a large forehead that protrudes out from the plane of the face, a triangular-shaped face, a pinky that is fixed or “locked” in a bent position (clinodactyly), lack of appetite/low BMI, and undergrowth of one side or limb(s) of the body (hemihypotrophy), resulting in unequal (asymmetric) growth. The majority of children with SRS fall within the normal range of intelligence, but are more likely to have motor and speech delays. Intervention at an early age (infancy) is critical. SRS is genetically heterogeneous, meaning that different genetic abnormalities are believed to cause the disorder. Abnormalities affecting certain genes on chromosomes 7 or 11 have been found in up to 60% of RSS patients, in up to 60% of SRS patients, leaving approximately 30-40% of patients where the underlying cause of RSS is not known and the patient must be clinically diagnosed. Some evidence indicates that there may be neurodevelopmental differences between the different genetic causes of SRS. This syndrome was independently identified by H.K. Silver in 1953 and A. Russell in 1954. In the early medical literature, the term Silver syndrome had been used to denote a child with low birth weight, overgrowth of one side (in fact, undergrowth) of the body (lateral asymmetry), and clinodactyly, whereas the term Russell syndrome had been used to denote a similar condition without asymmetry. However, most researchers now consider Silver-Russell syndrome one disease entity. The disorder is usually called Russell-Silver syndrome in the United States and Silver-Russell syndrome in Europe. The diagnosis of Silver-Russell Syndrome can be difficult because many of its features are also common to other growth disorders or idiopathic intrauterine growth retardation. The Netchine-Harbison SRS clinical scoring system (Aziz et al, 2015) is the only system developed using prospective data that also has both a high negative predictive value (meaning patients who are identified as unlikely SRS are truly unaffected) as well as a high sensitivity (meaning the system identifies the majority of patients who end up testing positive molecularly for SRS). This system is useful in determining which patients would be best served by having specialized SRS molecular testing. Molecular testing for the known SRS causes is recommended for patients who score 4 out of 6 factors or more. For patients under age 2, or who may score 3 out of 6, there may be enough suspicion to still warrant the SRS testing. Currently, the known causes of SRS involve abnormalities with chromosomes 11 and 7 and mainly do not affect the DNA itself, but epigenetic patterns required for a fine-tuned and balanced expression of so-called imprinted genes. These are genes which are expressed dependent from the parental origin of the respective allele. The most frequent cause of SRS is 11p15.5 hypomethylation [loss of methylation], i.e. affecting the imprinting control region 1 (ICR1; H19/IGF2:IG DMR). Duplications, deletions or mutations of 11p15 are also causes of the SRS phenotype but are very rare in incidence (about 5% total). Medical professionals interested in the genetic testing for Silver-Russell Syndrome may find it useful to review the EMQN guidelines in the article “EMQN Best Practice Guidelines for the Molecular Genetic Testing and Reporting of Chromosome 11p15 Imprinting Disorders: Silver-Russell and Beckwith-Wiedemann Syndrome” [Bliek et al, Eur J Hum Genet. 2016 May 11]. Chromosome 7 is implicated in SRS most commonly through maternal uniparental disomy, UPD(7)mat – either heterodisomy or isodisomy. Additionally, further molecular changes have been reported in a significant number of patients, these data have been included in the recently published guidelines for molecular testing for SRS/RSS. Strong phenotype-genotype research studies have found molecular abnormalities in approximately 50-77% of children clinically thought to have SRS. As such, SRS can be diagnosed with genetic testing, but negative genetic testing DOES NOT rule out a clinical diagnosis. But it is important to note that there are a number of other growth disorders, called differential diagnoses, that share key characteristics with SRS. If a patient tests negative for the causes of SRS, these differential diagnoses should also be ruled out (e.g., 3M syndrome, Mulibrey Nanism, SHORT syndrome). So how can a child be clinically diagnosed with SRS if molecular testing is negative or unavailable? The International SRS Consensus Statement (pending publication 2016, will published on this website as soon as it is published) recommends that when SRS molecular testing is negative, and known differential diagnoses have been ruled out, a clinical diagnosis of SRS can be given when the child scores at least 4 out of 6 on the Netchine-Harbison scoring system, and two of the four positive factors are relative macrocephaly at birth/neonatal and protruding forehead (ages 1-3 years). Most, but not all, children with SRS/RSS are born small-for-gestational-age [SGA], which means that their birth weight and/or length was greater or equal to -2SDS from the mean (below the 3rd percentile), adjusted for gestational age. Additionally, most SRS/RSS children have experienced intrauterine growth retardation [IUGR], which is when a fetus’ decelerated growth is diagnosed with ultrasounds while in-utero. But many children born SGA or diagnosed IUGR are not born with SRS/RSS. These are important distinctions to make. Beside the six criteria in the Netchine-Harbison SRS scoring system, there are a large number of physical characteristics common to patients with SRS. It is important to differentiate those that are common to other children born SGA or with IUGR, and those that may occur at a higher incidence rate in SRS children compared to other children with growth failure or who were born SGA. But to date, not one of these physical characteristics is unique only to SRS. Rather, it is the compilation of the factors that can differentiate a child with SRS from other patients. The two almost universal RSS/SRS physical characteristics are relative macrocephaly at birth and protruding forehead, and body asymmetry is almost always present in the 11p15LOM phenotype of SRS/RSS. 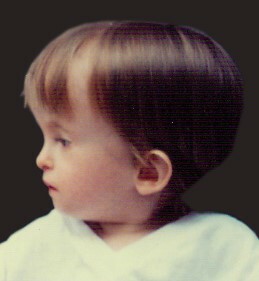 A physician is best able to determine if a child’s birth head circumference qualifies for relative macrocephaly but essentially it means “large head size for body” – if a child’s head circumference is roughly the equivalent distance of 45 percentile points on a normal growth curve higher than either length or weight. 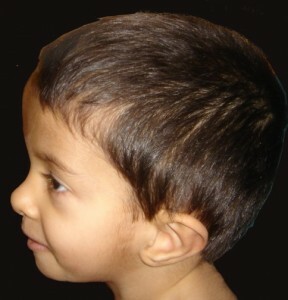 To determine if a child’s forehead protrudes from the plane of the face, a side view is required. Here is an example of a mildly protruding forehead and an example of a more significant protruding forehead. Body asymmetry in children with SRS is hemihypotrophy – where one body part or parts are smaller than the rest of the body. It is very important to differentiate this from hemihypertrophy because hemihypertrophy has been linked to an increase in Wilms tumors and can require vigilant monitoring for tumor growth. This risk of tumors is NOT linked to SRS body asymmetry. Body asymmetry is almost always present in the 11p15LOM phenotype of SRS and common but not always present in the other genotypes of SRS. A comprehensive amount of information about body asymmetry, including leg length discrepancies, shoe lifts and risks for acquired scoliosis, can be found in Chapter 4 of the book RSS/SRS/SGA – A Comprehensive Guide: Understanding Aspects of Children Diagnosed with Russell-Silver Syndrome or Born Small-for-Gestational-Age – a 330-page guidebook on the care of RSS/SRS/SGA children produced by The MAGIC Foundation and available from many of the Alliance patient-support groups. There are a large number of other physical characteristics that have been found to occur in SRS children. Some SRS studies have found that a number of the characteristics occur more frequently in SRS children than in SGA children who do not have SRS (marked with an asterisk below). Other characteristics are common to both (or have not been specifically studied). In addition, some characteristics are extremely common to one particular type of SRS (e.g., 11p15LOM or mUPD7, noted below). Please note that there is comprehensive information about each of these characteristics or issues in the book RSS/SRS/SGA – A Comprehensive Guide: Understanding Aspects of Children Diagnosed with Russell-Silver Syndrome or Born Small-for-Gestational-Age, produced by The MAGIC Foundation and available through many of our Alliance patient-support organizations. For example, there is an entire chapter on the gastrointestinal issues common to SRS patients, and a lengthy section in Chapter 4 on bone age advancement with examples to ensure a reader’s understanding of the concept. Please contact the patient support organization for your geographic location for assistance. Children with SRS are at high risk for fasting hypoglycemia because of the combination of their large brain-for-body size, low muscle and liver mass, and feeding difficulties. One study also showed that many of the young SRS subjects had hypoglycemia during the nighttime with no noticeable symptoms. Because ketosis usually occurs before fasting hypoglycemia, SRS specialists recommend the monitoring of urinary ketones as an effective method in the prevention of fasting and/or illness-related hypoglycemia. In addition, SRS children are especially vulnerable during illness or surgery. Intravenous glucose with 10% dextrose may be needed to eliminate ketones and prevent hypoglycemia. Because hypoglycemia can run the risk of damaging a young, developing brain, we are going to include important preventative information taken from documents created by The MAGIC Foundation as well as excerpted from the book RSS/SRS/SGA – A Comprehensive Guide: Understanding Aspects of Children Diagnosed with Russell-Silver Syndrome or Born Small-for-Gestational-Age, from a chapter titled “Fasting Hypoglycemia and Ketonemia” written by Madeleine D. Harbison, M.D., Richard Stanhope, M.D. and Jennifer Salem, M.A. This information may not be duplicated, copied or plagiarized in any manner. “Since the concept of ketones is so very important for SRS parents to understand, we shall give a simple and practical overview of a very complex metabolic pathway. Ketonemia and ketonuria normally precede hypoglycemia. Ketone body formation is associated with both a low blood sugar (hypoglycemia) and a high blood sugar, as in diabetes. In hypoglycemia, there is not enough sugar available to cells and in diabetes, the sugar cannot get into the cells. Normally, cells use sugar, (glucose), as their main fuel. When there is not enough sugar to fuel the cells, they begin to burn fat. Big fat molecules, (triglycerides) must be broken down into smaller molecule to be used as a fuel. Ketone bodies are these smaller, breakdown molecules from fat. The presence of ketones simply means that the cells are getting low on sugar and are using fat as a fuel. Ketone bodies are weak acids. When they build-up to high levels, they cause a severe acidosis. SRS children may develop a mild acidosis from ketones but never the severe ketoacidosis seen in uncontrolled diabetes. This is because the ketones seen in SRS are associated with a LOW not a HIGH blood sugar. IMPORTANT: There are some rare, genetic metabolic disorders that prevent normal fat metabolism [SCAD, MCAD and LCAD]. They result in hypoketotic hypoglycemia. This means hypoglycemia without normal production of ketones. For these children, ketonuria does not precede hypoglycemia; thus, monitoring for ketones does not help predict their development of hypoglycemia. As such, the safest policy is to assume that all SRS children are having nighttime hypoglycemia until proven otherwise, and steps should be taken to prevent hypoglycemia from occurring during the daytime hours. Symptoms are not hard to recognize, both ketonuria and hypoglycemia are easy to test for, and preventative measures are fairly simple to incorporate into the child care routine. Testing for Ketones: Parents can easily check for ketones in their child’s urine by using urine ketone sticks or strips that are purchased over-the-counter at a pharmacy. For infants and toddlers who wear diapers, place a couple dry cotton balls in the diaper when the baby urinates. Watch for their wetting and remove the wet cotton ball immediately then squeeze it over the ketone stick or strip. Older children should urinate into a cup and the ketone stick or strip can then be dipped into the urine. The test area’s color will not change if ketones are not present. Otherwise, it will change to a varying hue of purple depending upon the concentration of ketones in the urine. Once this timed reaction is complete, the color of the test area should be compared to the color chart on the side of the bottle. Ketone testing strips and sticks must be kept dry. All ketone measuring methods depend upon the same, moisture-sensitive chemicals in their test areas. Therefore, the strips must be kept tightly capped in a dry area, not a moist bathroom. Purchase a bottle containing the fewest tests; date the bottle when it is opened and use tests from a bottle no longer than one month after opening it. Routine baseline testing of ketones should be done before feeding to determine if the child’s feedings are frequent enough. Typically, the longest period between feeds is overnight. It is best to measure urine ketones after the early morning diaper change. Ketone testing should be done for several consecutive days to be sure that early morning ketones are consistently negative, because of the variability in the amount of food that SRS infants and toddlers eat day to day. If ketones are present in morning urine (or at other times), read the next section on treatment protocols for hypoglycemia and ketonemia. Testing the Blood Sugar: Talk to your pediatrician or endocrinologist if your child is spilling ketones and/or if you feel your child needs to have his or her blood sugar tested at home. There are many brands of small, hand-held glucose monitoring devices that are ever evolving in their accuracy, ease of use and computer compatibility. There are often coupons on-line for free units, or your physician can write a prescription for a unit and supplies. Also remember, in reality, these meters are made for monitoring diabetics whose blood sugars are more frequently high than low. For this reason, it is important that RSS/SRS/SGA parents make sure that the unit they get is accurate in the lower ranges. Your physician can help facilitate this. For SRS infants and children, the nighttime hours of prolonged fasting can represent a high risk period for ketonemia which may progress to hypoglycemia, because both the child and the parents are asleep, making signs of hypoglycemia both harder to spot and frequently unobserved. It is recommended that the parent check the child’s urines for ketone evidence (see prior paragraph) anytime the child’s sleep schedule is extended. For example, if an infant goes from sleeping 4 hours at a stretch to 5 hours, test the baby’s urine with a dry cotton ball at the 5 hour mark. The ketones should be negative for a full week before the parent can assume that it is safe for the baby to fast for this longer period of 5 hours instead of 4 hours. If an infant or child older than 8 months of age spills ketones after a nighttime fast, it is frequently possible to prevent this by adding uncooked cornstarch to his or her last feeding before bed and/or to their middle of the night feed. Giving an individual cornstarch functions like adding to the body’s stores of human starch called glycogen. The body uses the cornstarch for energy first before using the child’s limited glycogen store. An appropriate dose of cornstarch will last for close to 4 hours, and the child’s own glycogen storage will generally add another 2.5 to 4 hours – equaling a total of 6.5-8.0 hours of protection against hypoglycemia. The amount of starch needed to prevent hypoglycemia will depend upon the size of the child and his resting use of calories. Start with one level tablespoon per 4oz of milk or formula and go up as needed. The liquid needs to be stirred or shaken well as the cornstarch can settle. Three flat tablespoons is about the maximum tolerable and suspendable. The cornstarch is tasteless but can be a bit of a texture change – so we recommend slowly introducing cornstarch, beginning by mixing in only 25% of the cornstarch amount, for example, every day for a week. Then gradually increase the amount over time. It is important to remember that below 8 months of age, infants lack the enzyme necessary to break down cornstarch. Younger infants can break down the shorter chains of glucose polymer in the product “Polycose”. Polycose, in its liquid form, may look like light corn syrup but it is not the same. Do not use corn syrup. And never give honey to a child less than 24 months of age. The bottle of Polycose should give dosing recommendations. There are rumors that Polycose may be discontinued so talk to your pediatrician. Attempt a small feed of cool Pedialyte, flat Seven-Up or other soda. But during bouts of severe gastrointestinal infections (such as rotovirus), the above steps simply may not be enough and the child will need gut rest and an intravenous resuscitation until the child is able to eat normally again. Many, many parents can attest to the frustration of holding a vomiting child and having an ER doctor say that the child doesn’t need an IV because the child isn’t dehydrated. Ideally, the parent has made prior arrangements with their child’s pediatrician so that standing orders are at the local hospital. But if not, we have written a document that for medical professionals that you can use in times of illness when your child can not eat and needs an IV. We highly recommend that you print out this 2-page document and keep multiple copies in various places such as your car’s glove compartment. In addition, we have a downloadable document to assist you or your physician in the emergency care and treatment of your SRS child. This document was written for families in North America and your physician may have to make adjustments for your country and blood sugar measuring differences. Feeding difficulties and failure to thrive are quite common in SRS children. Although the typical child with SRS is born with length more restricted than weight, postnatally the SRS child experiences further decline in his weight curve. And the gastrointestinal problems that are so common to SRS children can make weight gain even more difficult. There are a number of ways that an SRS child’s weight can be improved – through nutritional/dietary changes or additions, the use of cyproheptadine as an appetite stimulant, the resolution of reflux, delayed gastric emptying and/or constipation, and lastly, through the use of non-volitional methods such as gastrostomy feeds. Complete information on all of these methods are in the RSS/SRS/SGA Guidebook, Chapters 5 (“Common Gastrointestinal Issues”), 9 (“Improving Your Child’s Weight”), 11 (“Nutrition: A Parent’s Guide”) and 12 (“Overcoming Oral Intake Challenges”). The Guidebook is available through many of our Alliance patient-support organizations. It is important, however, to note that it is often a balancing act in achieving the optimal caloric intake for SRS children. Research has found that SGA children have an inherent level of insulin resistance, and that rapid catch-up in weight gain can significantly increase the risks of developing health issues related to metabolic syndrome (including type 2 diabetes). Even without a rapid rise in the weight percentile curve, a small amount of excess subcutaneous body fat can increase the risks for these health issues. I’m not sure we can say that here, we have to be very cautious. Even without a rapid rise in the weight percentile curve, because of abnormal body composition, possible body asymmetry and low muscle mass, these children even with a normal weight for height can indeed develop an excess of subcutaneous body fat. With the risks of health issues related to metabolic syndrome, keeping SRS children as lean as possible is an important goal. Managing weight gain in SRS children is complicated by the fact that these children typically have a very low muscle mass. As such their weight-for-height can appear lower than is actual (because fat mass weighs less than muscle mass). SRS specialists recommend a target BMI that is within 12-14 kg/m2 using length or height measurements from their longer/normal side and/or a weight 75-85% of the 50th centile weight for length/height. It is well established through research, and summarized in the published SGA Consensus Statement, that a delayed bone age in SGA//IUGR children is not predictable of later growth. Instead, IUGR/SGA children typically experience rapid bone age advancement in older childhood until the bone age surpasses the chronological age before adolescence. Although there are limited published clinical studies on how SRS patients’ bone age advancement may differ from other IUGR/SGA children, it is accepted among SRS specialists that the SRS bone age advancement is even more pronounced than in idiopathic SGA/IUGR children. SRS children almost always begin with a delayed bone age, and most experience rapid bone age advancement around age 8-9 years. This is often accompanied by early adrenarche, especially in patients with SRS 11p15LOM. Patients with SRS due to UPD(7)mat are more likely to progress directly into central puberty, often at the early end of the normal range. As discussed earlier, rapid weight gain and/or excess fat mass can increase the endogenous insulin resistance in SRS children, which can then initiate adrenarche. The adrenal androgens are then aromatized to estrogens which result in the advancement of the bone age. It is believed that these small amounts of estrogens then trigger puberty. This cascade of events can result in a marked reduction in the final adult height, even with the use of growth hormone therapy. This bone age advancement effect of excess fat mass is another reason why it is critical to keep the SRS child as lean as possible. An SRS child should have a bone age x-ray once a year and read by the same physician each time, monitoring for any bone age advancement. If there are physical signs of adrenarche, or bone age advancement, a blood test of the child’s DHEA or DHEA-S level may identify if the child is in clinical adrenarche. When adrenarche has occurred with bone age advancement, but without central puberty, some physicians have been using a daily aromatase inhibitor anastrozole to slow the advancing bone age down. However, this use is not a pediatric labeled indication at this time. Currently, an 18-month double-blind clinical trial is ongoing studying the efficacy and tolerance of treatment with anastrazole to slow bone maturation related to pathological adrenarche in SRS or Prader-Willi Syndrome (https://clinicaltrials.gov/ct2/show/NCT01520467). If an SRS child enters central puberty either at too young of an age, or at an abnormally short height, suppression of the pubertal hormones can be achieved by using GnRHa treatment. The combination of growth hormone therapy and a GnRHa in cases of early puberty can result in improved final adult heights compared to the use of growth hormone therapy alone. When the onset of puberty is not precocious, the use of a GnRHa is not yet a labeled indication, and its use must be managed as a personalized treatment by an experienced pediatric endocrinologist in this field. The average adult height of an untreated SRS male is 151cm and is 140cm for an untreated SRS female (Wollmann et al, 1995). The only proven way of improving the final adult height into the normal range (above the 3rd percentile) and close to the individual’s midparental target height is through growth hormone therapy (GHT). And possibly more important, GHT has been found to result in many other improvements in health for RSS/SRS/SGA children. In 2001, GHT was approved by the United States F.D.A. as long-term treatment of growth failure in children who were born small-for-gestational-age and do not achieve catch-up growth by age 2 (but does not have approval for the SRS diagnosis). In 2003, the European Agency for the Evaluation of Medicinal Products (EMEA) made the same approval for SGA children who had not achieved catch-up growth by age 3. In other countries, GHT is not approved for children born SGA but in instead approved based on the SRS diagnosis. It is important for every family to connect with the patient-support organization familiar with your country’s medical system. SRS children do NOT need to be deficient in growth hormone in order to benefit from GHT. Studies have found no statistical difference in response to GHT between SRS children who are GH deficient from those who are not. As such, GH stim testing is not recommended especially because it requires fasting, which can be dangerous due to the risk of hypoglycemia. To ensure insurance coverage, make sure that your physician is using the most appropriate diagnosis code for your country (e.g., in the United States, it is the SGA diagnosis code that is most successful for insurance coverage of GHT not an SRS diagnosis). Besides improving final adult height, GHT has many other benefits for SRS children specifically, including: improved muscle mass, improved BMI, improved bone mineral density, improved appetite, reduction of hypoglycemia risk, and improved psychological and cognitive function. These are all discussed at length with research summaries in the RSS/SRS/SGA Guidebook. Large reviews of the records of all major GHT studies involving SRS children have indicated good safety records and extremely rare serious side effects. There have been NO findings of increased cancer risks. Start GHT as soon as possible (age 2-4 years) as it allows for more time to normalize the child’s height especially in light of the rapid bone age advancement that can typically occur in later childhood. With young children, use the lowest starting GH dose as possible that results in an improvement of the child’s growth velocity. This dose should be adjusted for weight gain every three months, and increased whenever the child’s growth velocity slows. If the child is already older (age 10-11+ years) when he is starting GHT, a high dose regimen may be used to maximize catch-up growth in the short timeframe available. Consider the additional use of an aromatase inhibitor if the child’s bone age advances, and/or a GnRHa if the child is in central puberty at too young of an age. As discussed earlier, individuals born SGA are at increased risk of adult health problems including coronary heart disease, hypertension, high cholesterol, insulin resistance and obesity, and metabolic syndrome. These risks are heightened in individuals born SGA who have rapid catch-up in weight, or a rapid increase in BMI. SRS young men who may have had undescended testicles (even if surgically brought down) may be at an increased risk for testicular cancer and should be monitored in adulthood. SRS females, especially those with 11p15LOM, may face some unique gynecological problems. There is a 16-page brochure titled “Transitioning to Adulthood” [which includes a separate brochure for the patient’s new adult endocrinologist] that was produced by The MAGIC Foundation and is available through many of the Alliance patient-support organizations. This brochure goes into detail about each of the possible health risks and what testing/monitoring is recommended.